Happy April! We Have Good News! 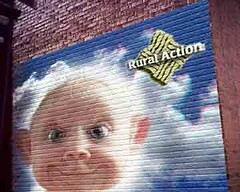 Rural Action Sustainable Agriculture has won a $500,000 grant to combat alien cow abduction in our region. "It's a daunting issue. Untold numbers of cows have vanished from dairy farms in Southern Ohio," said Tom Redfern, the Sustainable Agriculture Coordinator. The grant funds a pilot project to paint bovines with invisible dye that shows up under artificial light, for post-theft identification. To learn more about alien cow abduction, click here. 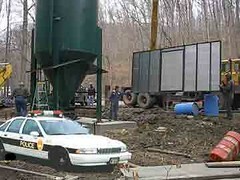 The recently-installed Essex Doser near New Straitsville, home of the Moonshine Festival, was busted Wednesday evening for being a clandestine still. Mike Steinmaus, coordinator of the Monday Creek Restoration Project, was taken in for questioning, where reportedly he declared, "I am Mike: the man, the myth, the moonshiner!" Bail money may be mailed to: PO Box 129, New Straitsville, OH 43766. Rebecca Black, a “water-quality specialist,” uses a pH tester to “measure acid levels” in the creek near the Essex Doser. Effective immediately, AmeriCorps*VISTA members will be paid in monopoly money, a spokeswoman for the state office of the Corporation for National and Community Service announced Thursday. Speaking on condition of anonymity, a VISTA serving with Rural Action said, "I hope that I can use this as a down payment on a house after my VISTA term is up." Helping AmeriCorps*VISTA member Sara Peach locate a contact lens. She lost it somewhere in the Trimble parking lot and won’t be able to proofread the next newsletter until it’s found. 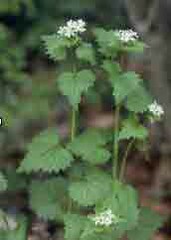 Garlic mustard, one of the invasive species to be planted in April. Sunday, April 16, 9 a.m.
Join staff and volunteers of Rural Action Sustainable Forestry for a planting of autumn olive, multiflora rose, and other invasive species in critical habitat areas. Volunteers will receive instructions on how to best distribute the plants so that they choke out indigenous species. 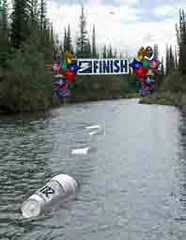 Last year's Styrofoam cup race was such a huge success that we've decided to hold it again as part of the garbage tossing festivities. Your kids will love it! Saturday, April 29, 3 p.m.
We are pleased to announce our newest member, Bernie Mac. Reportedly, he joined because his grandmother lives in Nelsonville. Well, it looks like we’ll be needing a new doser, since the sheriff took ours away. 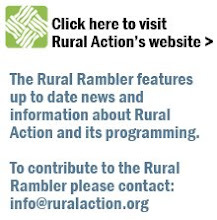 If you can provide one, contact Robin at robin@ruralaction.org. Per capita, Americans eat 70 hot dogs each year. 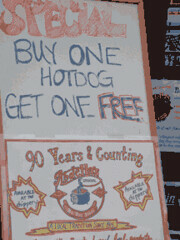 NOTE: The above is wholly and entirely false, except for the thing about the hot dogs.